The Christie organ was originally installed in the ‘Regent’ Cinema in Poole and opened on 4th July1931 with organist Jack Taylor (who also designed the specification of the instrument). The organ was removed by John Chalmers in 1968 and put into storage until Mr & Mrs Dowland, the licencees of the Antelope Hotel in Poole agreed to have the organ installed in the hotel’s ballroom. The organ opened in the Antelope on 18th February 1973 with John Egerton and Vic Hammet at the concert. The organ was used regularly at the hotel and was broadcast on a number of occasions. In 1979 it was decided that the organ needed to be removed. 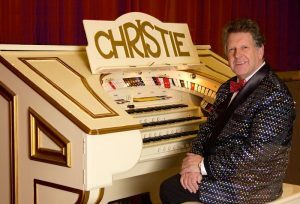 Peter Denison (owner of Sandford Park Holiday Camp) and Leslie Hartley (Sandford Park’s resident organist) decided that the Christie would be a welcome addition to the park. Leslie purchased the organ from the Antelope and Peter built a brand new ballroom at Sandford park to house the instrument. Leslie installed the organ and added various additions to the instrument and painted all of the pipes bright colours as the chambers were open for the public to walk through. The organ was used daily for dancing and evening entertainment by a variety of star organists. In 1985 the organ was purchased by Sandford park and star organist Brian Sharp was brought in as resident organist. The organ was then looked after by Stuart Jameson and was expanded to become 15 ranks in total and was used regularly for many years. The owners of Sandford park changed in the late 1990s and with the change of use of the ballroom the organ was used less and less. In 2004 Steve Tovey, Wolverhampton City Organist, was approached to find a new home for the instrument and contacted Ben Snowdon of Cardiff to see if he knew of a venue that was looking for an instrument. Having been to the Curzon and knowing that the Compton Melotone organ was still featured regularly discussions with the committee lead to the organ being put on long term loan from Weststar holidays to the cinema. The organ was removed from Sandford Park in 2004 and put into safe storage in the Curzon. Several years passed while the Curzon concentrated on it’s fund raising for restoring the roof and other important structural parts of the building, but in 2010 it was agreed to start installing the organ. As the organ had been extensively modified in it’s previous home, and was not in very good condition, it was decided to put the organ back to it’s original specification. The organ volunteers not only had to restore the instrument, but also so construct the chamber. The installation effort has been slow due to the volunteers only being able to attend on days off from their full time jobs, however after many months the organ is once again playing. The Grand Opening Concert was on 22nd April 2012 with Byron Jones at the console.